Blasting cabins industrial paint SPRAYMAQ, the best solution for your business. The cabins of shot blasting on sale Here you will allow get the best benefits of these facilities for paint. Enter the tab contact for more information about prices to buy. A full range of compressed air jet cabins, with total recovery, transport, classification and automatic abrasive cleaning. SPRAYBLAST cabins, they are designed to be installed indoors, protected from rain and moisture, needing a minimum or no civil work. Depending on your work and the type of abrasive used, We can use different systems and procedures collection, it allow us to supply you with the most suitable equipment. Collected over the entire surface of soil. Cabins without civil work on dimension zero. MONOBLOC cabin, load-bearing version fitted with all elements, get, connect and start the work. 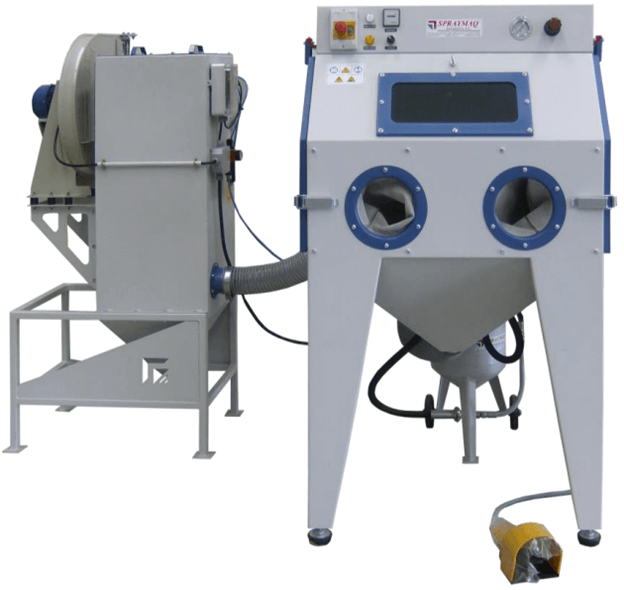 Different systems of abrasive above ground collection. The ventilation of the cabin comes in longitudinal direction. The strong depression created inside absorbs the outside air, that enters the cabin through ventilation outlets and is forced to walk along its entire length, transporting dust in suspension until the other end being retained on the outside of the filter cartridges. The cartridges are cleaned by compressed air to pressure, through special nozzles and electronically controlled electro-pneumatic valves. Cabin complete with total collection, by "SAM" mechanical drag conveyors, with longitudinal movement of scrapers, mounted on two parallel profiles, including the mechanisms and the floor grid, do not exceed the 150 mm. height from distance "0", so the Foundation needs are minimal. Made according to the dimensions required by the customer. Partial soil collection booths, they are indicated for reduced or intermittent work, in which the investment of this unjustified total collection. Made according to the dimensions required by the customer. Cabin complete with partial collection, by hopper, screw or suction system, the abrasive must be swept or shoveled manually until the aforementioned hopper, that feeds the elevator or the chorreadota. The continuity of the work of blasting, is limited by the time that it takes to deplete the stock of the silo and the blasting abrasive, Once exhausted abrasive, you have to proceed to the manual filling of the hopper, for a new cycle of work. They are similar to the previous sandblasting cabins, with total collection, but designed, for installation and operation, no civil work required. Made according to the dimensions required by the customer. Complete cabins, It allows the cost saving and the disadvantages of a civil works in ships installed. All the elements of the cab are mounted on dimension zero. They are total collection blasting cabins, portable and transportable by special truck, equipped with all the necessary elements for a continued work. (Filter cartridges, Elevator, Sandblaster lighting and elements of collection on the entire surface of soil) connect air, electricity and work. Realized with the following dimensions. Of 6 and 12 m. length x 2,5 m. wide and 2,5 m. high. (measures external aprox.). Use at day time, abrasive type to be used, and the customer's specifications, they incorporate cyclone and special deflectors to avoid lost of abrasive carryover of ventilation. 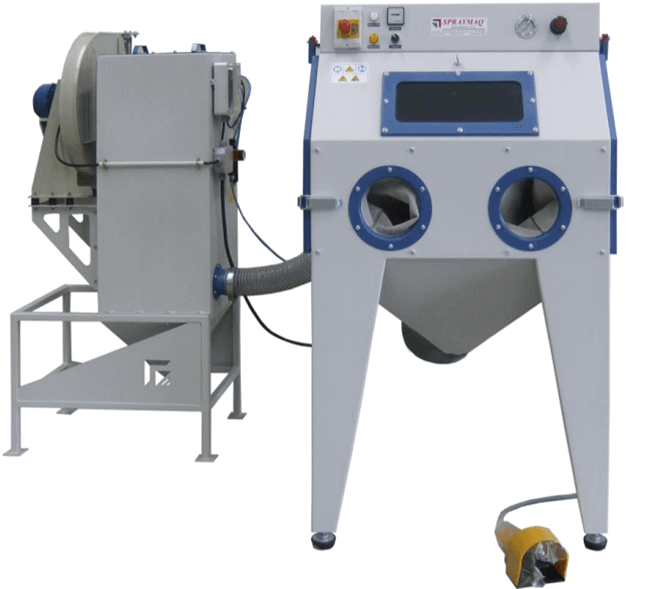 The OPTIMUS S model is an equipment of blasting manual suction indicated for jobs that do not require large production. Its excellent features make it Excel in works where you need a high quality surface finish, but at a lower working pressure compared to units with Sander, requiring a lower compressed air consumption. The projection of the abrasive is produced by venturi effect in the spray gun, and the recirculation of the same through the cyclone of particles and the FC-1 filter. OPTIMUS P model is an equipment of blasting manual pressure indicated for jobs requiring more production, speed and suction anchor that. and the recirculation of the same through the cyclone of particles and the FC-1 filter. Cyclone and dust by cartridges filter. 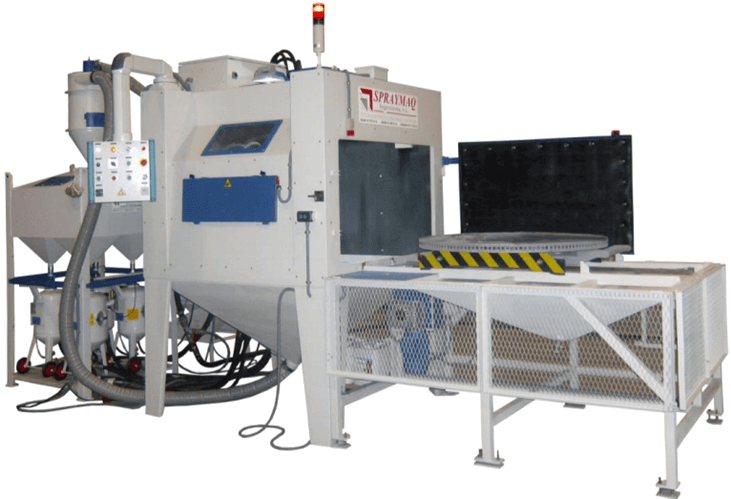 In addition to sandblast cabins also have another type of cabins and facilities that may interest you as all kinds of paint booths, industrial cabins of metallic and different filtration equipment.